Under Section 5(a)(1) of the Occupational Safety and Health Act (known as the General Duty Clause), all employers are required to provide their employees with a “place of employment which [is] free from recognized hazards that are causing or are likely to cause death or serious harm to [their] employees.” In other words, all employers are legally obligated to take reasonable care in providing a safe workplace to their employees. Regardless of how much reasonable care you put into making your employees safe at work, accidents will inevitably happen. This gap leads to the question of who is responsible for such accidents and who pays for the injury? Workers’ compensation insurance fills in the gap by covering injuries and occupational diseases picked up by employees at work. Under Arizona Employment Law, employers are generally required to secure workers’ compensation insurance for all of their employees. For an employee or an employee’s family to be eligible for workers’ compensation benefits, the employee must be injured or killed by an accident arising out of and in the course of their employment. To qualify as an “accident,” an event must be unexpected and unintentional. For the accident to “arise out of” employment, there must be a causal, not coincidental, relationship between the work and injury. Workers’ compensation is a “no fault” system, meaning that injured employees will receive benefits for job-related injuries they receive as employees within the scope of their employment, regardless of who actually caused the accident. The “no-fault rule remains true, even if the employee was at fault or partially at fault in causing the injury. An Arizona employee is generally not, however, entitled to such benefits when injuries are purposely self-inflicted. When dealing with workers’ compensation claims, it is critical to assess whether the injury relates to an inherent risk in the job. For an accident to be “in the course of” employment, the accident generally must occur in the time, place, and circumstances of the work environment, and it is not limited to injuries that occur while employee is performing the classical duties for which they were originally hired. Workers’ compensation is the exclusive remedy for these kinds of workplace injuries, whether the employee chooses to take advantage of it or not. Who administers and enforces workers’ compensation laws and regulations? The Industrial Commission of Arizona (“ICA”) administers the laws and regulations applicable to the protection of life, health, safety, and welfare of employees within Arizona. The ICA’s regulatory duties include various activities, such as holding hearings to resolve workers’ compensation disputes as well as monitoring the insurance carriers processing of industrial injury claims. Workers’ Compensation generally covers most injuries and losses to employees, such as loss of limbs, diseases (e.g., emphysema or repetitive motion), medical treatment, rehabilitation necessary to return to work, death, etc. In addition to medical coverage for injuries and rehabilitation, injured employees may be able to receive benefit payments related to lost wages and permanent disabilities. When an employee is unable to return to work for over a week as a result of a work-related injury, that employee might be able to receive time lost benefits (compensation) in addition to medical coverage for wages they did not receive while absent from work. Time lost benefits amount to two-thirds of an employee’s monthly earnings, which is based on the previous thirty days of work. Currently, employees sustaining injuries during the 2018 year can receive a time lost benefits maximum of $4,625.92. Employees are only eligible for time lost benefits of up to two-thirds of their monthly wage while they are receiving active treatment for their injury by a doctor. As employees recover and hold a limited ability to continue working, they might return to work for their employer under modified circumstances in order to accommodate the injury. Employees who are earning less from work as a result of a lighter schedule can continue to receive time lost benefits at two-thirds of the difference between their pre-injury and post-injury wages. At some point, if an employee fails to fully recover from an injury, a doctor could make the decision that the employee has a permanent disability because the employee’s condition is stationary (no longer expected to significantly improve). With a permanent disability assessment from a doctor, an employee might be eligible to receive permanent compensation through workers’ compensation insurance. How much an employee is compensated will depend on a number of factors, especially the severity of the injury. Compensation for permanent injuries is typically paid monthly. For more information on how permanent compensation for injuries is determined, contact our office today. When does an employer need to have workers’ compensation insurance? Pursuant to A.R.S. 23-902, every state, county, city, town, municipal corporation, school district, and “every person who employs any workers or operatives regularly employed in the same business or establishment under contract of hire, including covered employees pursuant to a professional employer agreement, except domestic servants,” is required to carry workers’ compensation insurance for their employees. The same Arizona Employment law defines “regularly employed” to include “all employments, whether continuous throughout the year, or for only a portion of the year, in the usual trade, business, profession or occupation of an employer.” In other words, unless the employer or employee is subject to an exemption from providing it, all employers must carry workers’ compensation insurance for their employees. Does an employer have to carry workers’ compensation insurance for independent contractors whom it employs? Generally, employers are not required to supply workers’ compensation insurance to independent contractors, as long as the employed individuals are in fact independent contractors. Employers often (intentionally or unintentionally) misclassify workers as independent contractors when they should really be employees. This error can lead to serious consequences for employers who refrain from providing workers’ compensation insurance. Because disputes over whether a worker is an independent contractor or employee are determined on a case-by-case basis by courts, employers should make sure they understand what an independent contractor actually is. Factors considered by courts in deciding whether a worker is actually an independent contractor, as opposed to an employee, include: the duration of the individual’s employment, how the individual is paid, the right of the employer to hire and fire the individual, how much control the employer has over the individual’s work, who supplies the individual’s tools, who sets up the worker’s schedule, and whether the work performed was done in the regular course of the employer’s business. If your worker fits the description, then you might be fine to avoid paying for workers’ compensation insurance. Workers’ compensation is also not usually required for domestic servants who work in an employer’s home. If you are unsure as to whether an individual is an employee or an independent contractor for workers’ compensation purposes, contact one of our experienced employment attorneys today. 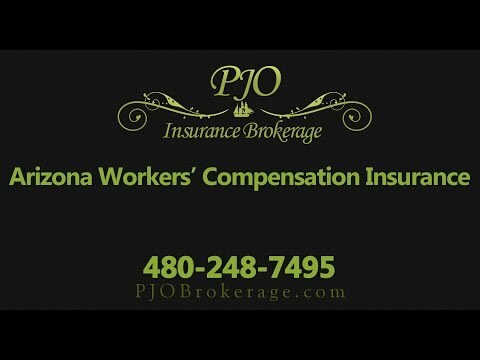 Does an employer in Arizona have to carry workers’ compensation insurance for part-time employees? Generally, yes. Arizona Employment law requires that “every person who employs any workers or operatives regularly employed in the same business or establishment under contract of hire” provide workers’ compensation insurance for their employees. By and large, “any workers” includes part-time workers so long as they are not independent contractors or domestic servants. Does an employer in Arizona have to carry workers’ compensation when it employs only one or two employees? Generally, yes. Arizona law requires that “every person who employs any workers or operatives regularly employed in the same business or establishment under contract of hire” provide workers’ compensation insurance for their employees. By and large, “any workers” will include even one employee so long as that employee is not actually an independent contractor, casual or infrequent worker, or a domestic servant. What if I am a sole proprietor? If a sole proprietor does not have any employees working for him/her, then such sole proprietor is not an employer under Arizona law and therefore is not required to pay for workers’ compensation insurance. However, if the sole proprietor does employ any other individuals, then he or she will be required so long as the individuals employed are not independent contractors, casual or infrequent workers, or domestic servants. If an employee-less sole proprietor so chooses, they may elect to secure personal workers’ compensation insurance. What if I am a corporation? Under Arizona law, a corporation has the same duty to provide workers’ compensation insurance as any other individual or entity. If the corporation employs individuals who are not independent contractors, casual or infrequent workers, or domestic servants, then the corporation will be required to secure workers’ compensation insurance. What if I am an LLC? Even if an Arizona LLC employs just one individual, it will be required to provide workers’ compensation insurance, unless the individual is an independent contractor, a casual or infrequent worker, or a domestic servant. What if an employee elects to not be covered by an employers’ workers compensation insurance? While it is generally not a smart idea for an individual to do so, an employee may voluntarily elect not to receive worker’s compensation coverage by an employer. However, an employer is prohibited from requesting or influencing an employee to make this decision by any means. What happens if I do not have workers’ compensation insurance? Please…do not let this happen to you! First off, in Arizona, an employer that does not carry Workers’ Compensation Insurance is guilty of a Class 6 felony, regardless of whether or not an employee was actually injured, and can be sentenced to a $1,000 penalty for a first-time offense. Such penalty will be increased to $5,000 for a second-time offense within a five-year period and then $10,000 for a third-time offense within that same five-year period. If an employee suffers an injury under an employer who has not secured workers’ compensation insurance, then the employee can file a workers’ compensation claim with the ICA, or the employee can file a civil lawsuit. Either option is not good for the employer. When an employee files a workers’ compensation claim, the ICA will review the claim and, if accepted, pay any medical and/or compensation benefits of the employee. The ICA will then seek reimbursement of such compensation from the employer and tack on an additional 10 percent penalty. When a worker chooses to file a workers’ compensation claim against an uninsured employer, the compensation for lost wages will be capped as a matter of law; however, in civil court, there is no cap on the amount of damages an injured worker can claim. Additionally, worker’s compensation claims with the ICA, unlike civil lawsuits, disallow employees from seeking punitive damages. If an employee or former employee has filed a civil lawsuit or workers’ compensation claim against you, there are a number of steps you can take to effectively defend yourself and mitigate damages. For help, contact an experienced labor and employment attorney today. Where do I purchase Workers’ Compensation Insurance in Arizona? Workers’ compensation insurance for your employees should be purchased through an insurance company that is properly licensed to issue workers’ compensation insurance in Arizona. Self-insurance is also permitted for employers who meet certain requirements and are approved by the ICA. Visit the ICA website for a list of authorized workers’ compensation insurance providers. For any additional questions, call our office today. Should you hire an attorney to represent you? The Workers’ Compensation Act lays out a substantial number of liabilities and obligations and some are difficult to understand. While you may be hesitant to secure workers’ compensation insurance for your employees, it is important to understand that not purchasing workers’ compensation insurance could land you in serious financial trouble if one of your employees is injured. Moreover, providing it to your employees is the law. If you find yourself on either side of a workers’ compensation claim, give us a call today and we will help you navigate through the complicated process in order to achieve the best results possible for you.